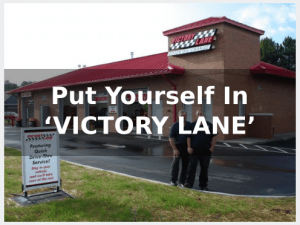 Victory Lane understands that you made a significant investment in your vehicle. It is important to properly inspect and maintain your vehicle to ensure maximum life and performance. Victory Lane’s Full Service Oil Change is designed to ensure that your vehicle is receiving the appropriate attention at the appropriate time. We use only top brand oils, filters and additives so that you can have peace of mind while on the road. Victory Lane also believes that complete preventative maintenance is critical to the life of your vehicle. That is why we do not stop at changing your oil and filter. At Victory Lane you receive a comprehensive 20 point preventative maintenance service and inspection check. At Victory Lane we believe in providing choices. We understand that every vehicle is not created the same. Victory Lane offers; conventional, synthetic blend, full synthetic, high mileage and eco-friendly oils. These oils are specifically designed to meet the needs of different engine types and driving conditions. Victory Lane will assist you in deciding which choice is best for your vehicle and your specific driving conditions.